The movement against corruption has called for a new round of demonstrations following the elections. For them there is an understanding that the resignation of Otto Pérez Molina was only the beginning of a larger movement. Since April 2015, Guatemala has been gripped by a corruption scandal following revelations of a criminal network operating at the highest levels of government. This scandal has lead to the resignation and arrests of both the President Otto Pérez Molina and Vice President of Guatemala, and led to the resignation of dozens of public officials. Despite the current climate of corruption, scandal, and crisis, Guatemalans turned out to vote for the President’s replacement. Though they vote believing that the politicians in the current race are all corrupt. On the day prior to the elections a few hundred protesters gathered to demand that they be delayed. Protesters argued that in this climate of crisis, the country could not legitimately hold elections. During the protest, a small theater collective preformed a skit with three characters, one dressed as a pig, the other a monster, and the third as the devil. Each one represented the 3 front-runners, Baldizon, Morales, and Torres, and were paraded around by a woman who represented the clueless television personalities that are common in mainstream national television. At the end, the crowed was asked to vote for one of the three candidates, who were all equally horrible. This skit represents Guatemala’s current electoral process as a tragic three-ring circus. The tragic clown is Morales, the marionette that he is, is front and center. To the surprise of many observers, nationalist candidate and former comedian Jimmy Morales won a majority of votes. He was unable to obtain a majority, and will face Sandra Torres, a center-left for the political party United Nation in Hope, or UNE in the Spanish acronym, who campaigned on development and jobs, in a runoff election on October 25. For many, Morales, who has a long running comedy show on Guatemalan television, was not a serious candidate. But he ran on a nationalist platform, and presented himself as an outside candidate who was “un-corruptible.” Because of this, he managed to win the first round. However, behind this “political outsider” are many of the same forces and influences that led to the current political crisis. One of the most surprising results that has come from the protests during the elections has been the popular backlash against Dr. Manuel Baldizon, who many had considered to be the presidential frontrunner. Baldizon, a wealthy businessman and politician from the department of Peten, had become a target of protesters in the lead up to the elections. During the protests, the chant “It isn’t your time,” became popular across the country. The chant came as a reaction to an early billboard that the Baldizon campaign ran depicting the presidential hopeful wearing the Presidential sash, with the text “It is his time.” Despite the attempt by the political party LIDER and Baldizon to buy votes and sway the election, the candidate was not able to garner the support needed to make it through to the next runoff. The movement against corruption and the backlash to the candidate’s overconfidence that he would win the presidential race were what it took to bring down the businessman. But despite the backlash against their presidential candidate, Manuel Baldizon, LIDER won a majority of the races for mayor, and a majority of seats in Congress. In Santa Eulalia, Huehuetenango, incumbent mayor Diego Marcos Pedro, who switched to the LIDER party ahead of the election, lost the election to the candidate from the TODOS party. Marcos Pedro is embroiled in a scandal related to the closure of community radio Snuq Jolom Konob, which was censored in January 2015. The now former mayor faces 5 criminal cases related to the closure of the radio, and for the violent attack against journalists and supporters of the radio station in March 2015. The cases and the attack played an important part in voters voting against the incumbent. In Quetzaltenango, the movement helped bring to power a new mayor from the moderate leftist party Encuentro Por Guatemala. Donald Urizar, an organizer from Quetzaltenango, describes the election of Luis Grijalva as “a small citizen’s victory that we achieved together.” The movement organized to support Urizar, winning him 33 percent of the vote. He won out over the candidates from Partido Patriota and LIDER, both of whom had received millions in support for their campaigns. The week following the election was marked by consistent protests in communities against the election results. Communities have denounced inconsistencies and called for investigations into the cases. However, not all regions remained peaceful following the election. In Senahu, Alta Verapaz, protesters shut down the highway with burning tires in protest over the election results. In Chisec, a dispute between supporters of UNE and UCN led to a violent conflict between supporters. The Guatemalan Supreme Electoral Council building has continued to be the site of protesters demanding that the electoral body investigate inconsistencies in the elections. “This was never just about Otto Pérez Molina,” said the organizer Urizar. “(This is) about changing Guatemala into something that benefits all Guatemalans.” He adds, “four months really isn’t anything. We are still creating a new Guatemala without violence and without weapons. We have an obligation to continue the movement.” The results of the September 6th election expose that the movement still has a lot of work to do. The same powers that were behind Pérez Molina have once again emerged through this election through the candidacy of Morales, which isn’t lost on the protesters. “Jimmy and his party have ties to the far right and the military,” said Urizar. Historically, the far right in Guatemala has had a deep tie to the military and the status quo. The hardliners have justified overthrowing democratically elected governments to protect the interests of national elite. As Urizar and others in the movement acknowledge, former President Otto Pérez Molina was only part of the corrupt Guatemalan political system. As the tragic history of Guatemala has shown, corruption expands to all parts of the power structure, including the military and the business community. Protesters know that the corruption will reemerge once again. The hydra that is the Guatemalan Military-Political project has sprouted a new head. The National Convergence Front, or FCN-Nation party, represents the old guard of the Guatemalan military, and represents the continuation of the military-political project, which was also responsible for the theft of millions of dollars during the administration of Otto Pérez Molina. Former Generals Luis Felipe Miranda Trejo and José Luis Quilo Ayuso, both of whom were from the Association of Military Veterans of Guatemala (AVEMILGUA), founded the FCN-Nation party in 2004. Both Miranda Trejo and Quilo Ayuso were active during the 1980’s, during the height of the genocide against the Mayan people, and both came from military intelligence, commonly referred to as S2; the same office that produced disgraced president, Otto Pérez Molina. They were active during the darkest days of the war. The founders have a deep connection to war crimes, and violence from during the years of the internal armed conflict, and especially during the time of the genocide against the Mayan people across the country between 1981-1983. The founder of the FCN-Nation, Miranda Trejo, was a member of the Guatemalan Military Intelligence group S2, and was stationed at the Coban military base between 1982-1983. It was during this time that over 500 people were murdered and buried at the base. Maldonado had served as an Operations Officer in the department of El Quiche during the period of the genocide against the Ixil people, between 1981-1982. Following his deployment there, he was transferred to Coban, where he served for 6 months in 1983. Quilo Avuso has openly acknowledged his training in counterinsurgency in the United States. According to Dr. Orlando Pérez, the Assistant Dean of the College of Arts, Humanities and Social Sciences at the Millersville University of Pennsylvania, who has spent his career studying the militaries of Central America, the party was founded in 2004 following an “attack” against veterans by families of the disappeared on June 30, Guatemala’s Day of the Military. The two decided to form the party because of the perceived disrespect for the military in post-war Guatemala. The party has remained small, and relatively insignificant up until the 2015 race, when the alliance was made with comedian Jimmy Morales, who became the new face of the party. In 2012, Edgar Justino Ovalle Maldonado, a former General and member of FCN’s executive council, approached Morales, and offered him a presence in the party. The following year he was named the party’s chair. Yet another member of the party, Navy Captain Romeo Guevara Reyes, served as the head of the Police ahead of the attempted 1989 Coup d’état. He was removed from the position just before the coup, and was arrested as a conspirator. In 2011, he was listed as a member of the Executive Committee of the FCN ahead of the 2011 presidential election. Despite these connections, the Morales campaign has claimed that the former generals no longer make up the party. In fact, Quilo Ayuso is confirmed to have left the party. 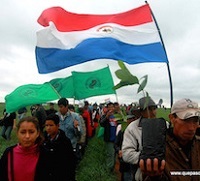 The campaign of Sandra Torres doesn’t offer much of an alternative to the military interests of Morales and FCN-Nation. Her party has backing of the Guatemalan business community, and in many ways looks to continue the policies of the administration of her former husband, Alvero Colom. The center-left administration of Colom was notable for the formation of the anti-corruption body CICIG. It is also remembered as the beginning of the process of reforming the judicial system. But the administration was also accused of corruption, and escalating the conflicts over the extractive industries. This is not the first time Torres and UNE have been accused of corruption and violating the law. In July, the United Nations back International Commission Against Impunity in Guatemala (CICIG) issued a report detailing the 3 largest political parties, Partido Patriota, LIDER, and Torres’ UNE in participating in corruption, violations of electoral law, and influence peddling. The same report also detailed the presence of illicit financing from narco-traffickers, lumber-traffickers, and national and multinational companies within the campaigns of UNE, PP, and LIDER. The accusations come from this current election cycle, and past electoral cycles. The Left may not have been able to win the presidency, but they won other smaller victories. Leftist mayors candidates from the URNG won in Malacatancito in Huehuetenango, San Pablo in San Marcos, and San Andrés Semetabaj in Solola. The Left was also able to expand their presence in congress. Pop, a lawyer and head of the Winaq party, was the first to file criminal charges against former Vice-President Roxana Baldetti, and former President Otto Pérez Molina shortly after the revelation the criminal network operating in the administration. He had faced death threats for his part in raising the charges against the President. Winaq and Pop are part of the new left movement in Guatemala. They represent the left that wasn’t connected to the guerrilla movement of the 1980’s. Historically the leftist parties have been weak in Guatemala. Following the signing of the peace accords, which brought an end to 36 years of war, the Guatemalan National Revolutionary Unity, or URNG in the Spanish acronym, the union of the 4 different guerilla movements from during the war, made the peacetime transition to becoming a political party. But this wasn’t without difficulty. Latent division between the former guerrilla organizations led to a rupture with in the party. In the years that followed, the new political party saw several leaders leave the party to form their own political parties, including former Guerrilla Commander Pablo Monsanto who founded the New National Alternative (ANN), which would become the Convergence for a Democratic Revolution (CRD), or Convergencia. During the 2015 election, the 4 leftist parties formed two alliances. 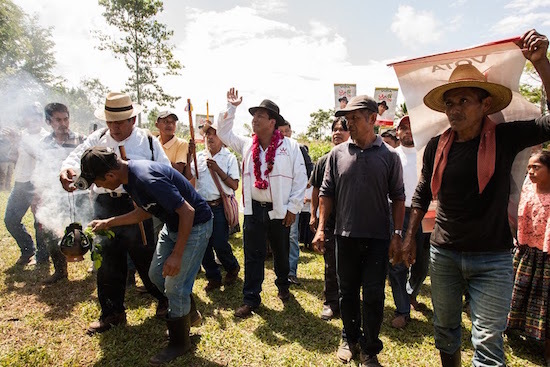 The Consejo de los Pueblos Occidentes (CPO), an organization that represents the indigenous Maya of the western highlands, joined the CRD, while the URNG formed an alliance with Rigoberta Menchu’s WINAQ party. The alliance has organized their campaign with the bare minimum of resources. Since its’ founding in 2010, WINAQ has especially been close to the indigenous rights movement. Part of this is the reclaiming, and legitimatization of the indigenous clothing within congress. Pop has become well known for his signature hat that he wears in congress, which is part of the indigenous traditional clothing. The institutional left had hoped ride the wave of popular dissatisfaction to make big gains in the government ahead of the election. And in some ways, they were able to accomplish this. The left still remains a minority in the congress, but slowly they are beginning to gain more of a voice in the system. They were able to increase their presence in congress from 3 seats in between 2012-2015, to 10 seats combined for the Covergencia, Winaq, and URNG in the current election cycle. Besides the re-election of Pop, Leocadio Juracán, from the campesino organization Campesino Committee of the Highlands (CCDA) who was running under the Covergencia ticket. 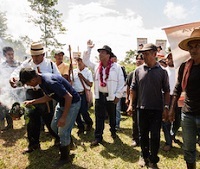 Juracán has been an important leader in the campesino struggles across the country. Sandra Morán also will be joining the congress as part of the Covergencia. Morán has been an important voice in the urban struggle, and as part of the movement against corruption.